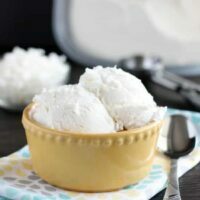 No Churn Coconut Ice Cream (+ Video) - Dessert Now, Dinner Later! 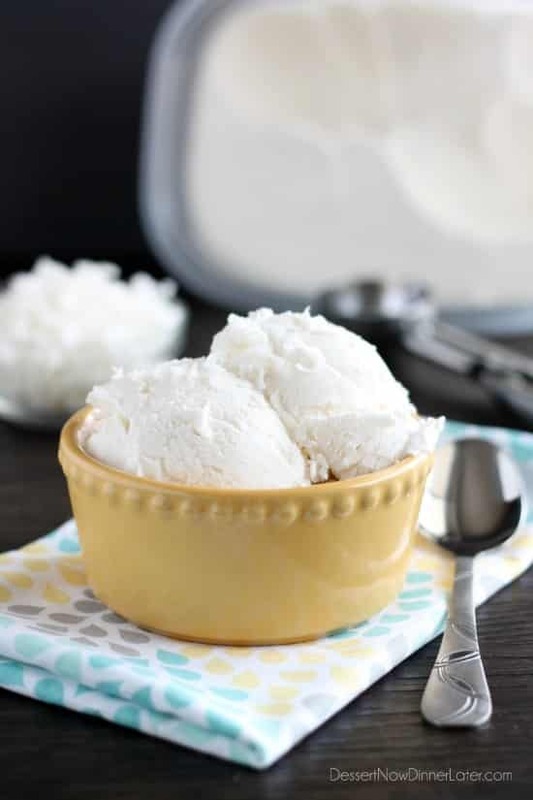 Only 2 ingredients to make this creamy, smooth coconut ice cream without a machine! Last summer I went a bit crazy with no churn ice creams. I shared Oreo Fudge, Chocolate Peanut Butter Cup, and Cake Batter no churn ice cream recipes! Well, I’m back with another version! 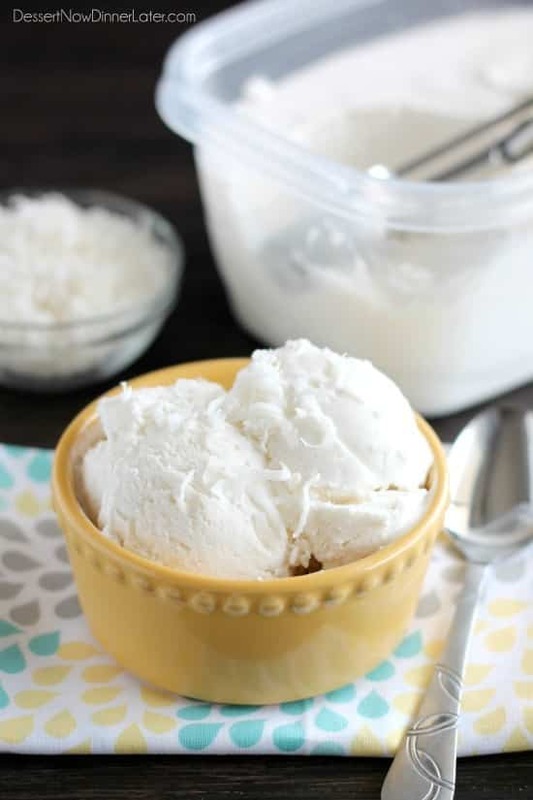 This Coconut Ice Cream, is only 2 ingredients and ridiculously delicious! We are already planning on making it again! I have a specific recipe coming on Thursday that I made this particular ice cream for, so stay tuned for that, but this coconut ice cream is perfect as is straight from the freezer! Smooth and creamy! If shredded coconut is not your thing, no worries! It’s in the picture as a garnish, but it’s not in the ice cream! There might be tiny bits of coconut from the cream of coconut, but they are few and far between bites. This recipe is as simple as heavy whipping cream and cream of coconut! Now, if you haven’t used cream of coconut, you will be converted! I have made fruit dips and frozen drinks with it like crazy! I’ve also used it in cake. SO GOOD! You can find Cream of Coconut in a 15oz can (pictured below) in the alcoholic mixers aisle. It’s non-alcoholic, so it’s safe for the whole family to enjoy. It’s creamy, coconut-y, and sweet! The perfect base to make coconut recipes with! Fold in the cream of coconut until mixed well. Pour the ice cream mixture into a 2 quart freezer safe container. Freeze 6 hours or until firm; freezing overnight is best. Store in the freezer. Your simple sweets are always the best, Amber! I love this ice cream. I’ve never seen cream of coconut before but then again I’ve never looked for it. I’m going to have to find because this ice cream needs to happen! My husband has been begging me to make this again! You have to find the cream of coconut! It’s in the aisle with the alcoholic mixers because it’s used for Pina Coladas. How many calories per serving and what is the serving size? Coconut is my favorite! 1/2 cup is 222 calories. Enjoy! This sounds and looks amazing! I’m a coconut lover! Thanks Lindsay! It was so good! I love coconut, but not coconut flakes in my smooth ice cream. This was perfectly smooth and so coconutty! 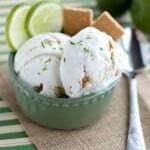 I love no churn ice cream recipes, having to break out the ice cream machine can be such a pain! 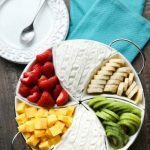 My husband is obsessed with coconut, he’d be so happy if I made this for him. Oh I bet he would love this! Thanks Danielle! I love coconut! Making ice cream in our ice cream maker with all the salt and ice is fun on special occasions, but I don’t like to do it very often. I’ve never tried this method before, we’ll have to do it soon! I have one of those ice cream makers where you freeze the bowl, but then I have to plan ahead. It still takes time to wait for this to freeze so I guess it’s the same, but I know a lot of people don’t have ice cream makers and this way is so easy, it’s hard to pull out my machine anyway! If you have a Safeway or Fred Meyers store or even a spanish bodega (Grocery Store) near you ask for go the Spanish food section. There you will find Goya products. 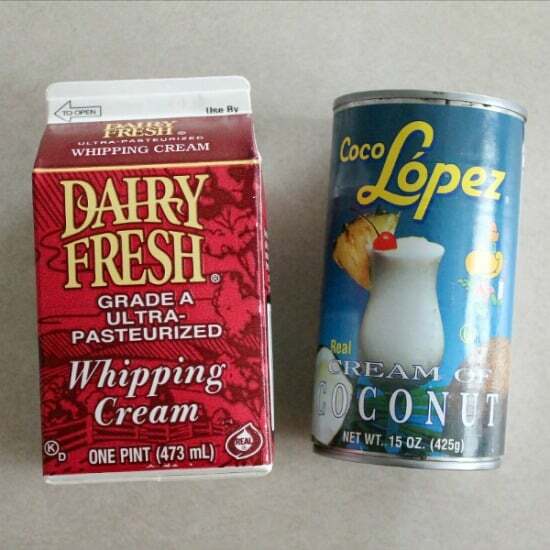 Look for Goya Cream of Coconut (Crema de Coco or they may have Coco Lopez Cream of Coconut. Great stuff. My wife used a stand mixer with the ice cream attachment and made an Oreo Vanilla ice cream and it was the best tasting ice cream I believe I’ve ever had. I am going to try this Coconut Ice Cream recipe first thing in the morning so it will have a chance to set by the time everyone gets home. It sound so easy to make that I think I will make Coconut Ice Cream lovers out of the entire family. Hi Mike, Thanks for your tips to check the Hispanic food section. I love Oreo ice cream too! I hope you all enjoyed this one too! Love easy ice creams like this! This sounds great! Yeah, this was so easy! Going to try it in the ice cream maker to see how the texture differs, but it still works great as a no churn ice cream. I seriously can’t wait to make this! I am coco for coconuts especially coconut ice cream! I can’t believe you only need 2 ingredients too! I’m definitely going to look for cream of coconut next time! Love this, Amber! You’ll have to let me know what you think! Coconut is a fave flavor of mine! Don’t wait for summer to make this! Get on that now! I have been craving coconut for a week now. Cream of Coconut is a staple in ny cabinet and I opened a can just for a few spoonfuls to quench my craving. Now I can’t wait to make this! Our grocery stores carry it in the Hispanic food section. That’s awesome! Cream of Coconut is SO delicious! Thanks for the heads up on somewhere else to find it in the stores! This looks so creamy and yummy! I was surprised that you don’t add even a little sugar! Thanks Julie! The cream of coconut has sugar in it, so there is no need for extra sweeteners! Just made this and from licking the whisk its going to taste amazing!!! Thank you. I zested a lime over the top before I froze it. Can’t wait. Hi there! I tried this recipe once before in March I believe and for some reason it didn’t work. Although I specifically looked for cream of coconut, something went wrong. The mixture was stone hard after freezing. However, yesterday I found another version of cream of coconut in the Turkish supermarket around the corner and that cream of coconut was completely different to the one I had used in March. So I figured, the other product had the same name by chance but wasn’t the same as the cream for the cocktails. Anyway, I just put my new batch in the freezer and the taste already is so delicious. This time it’ll work for sure. Can’t wait until tonight to try it. That’s so crazy they were totally different! Glad you got it to work out! Did it but the ice cream had some ice crystals in it? Any idea why this happened? If it took too long to freeze, it will kind of melt and then freeze causing the sugar crystals. You can try freezing the container you will put the ice cream in first, then add the ice cream, and put it in the coldest part of your freezer so it can freeze faster next time. I hope you can try it again! Are you kidding me? Is this legal? I will for sure try this tomorrow! Thanks so much. I hope you love it! My husband begs me to make it often! You will love this then Helen! I’ve put cream of coconut in A LOT of recipes on my blog! I just made this ice cream! Now I’m impatiently waiting for the 6 hours to go by! Can’t wait to try it! It looks awesome! Sounds like a great addition to the ice cream! I hope you love it! If I don’t have the patience to wait for the no-churn action to happen, can I use my Cuisinart Ice Cream Maker with this recipe? Absolutely! Just stir the heavy cream and cream of coconut together and pour it into the ice cream maker. Let it run according to the instructions of the ice cream machine. Mine is a Cuisinart ice cream machine where you freeze the bowl. I just let it go until it’s a soft serve texture. Enjoy! I find the cream of coconut in the Mexican food section at my local grocery store. I am going to make this. Sounds yummy. I like Catherine’s idea of putting some chocolate sauce or syrup on top. Mounds ice cream! Think I may put my mixing bowl and beaters in the freezer before whipping the cream and refrigerate the cream of coconut so it is also cold.. May help freeze it quicker avoiding any ice crystals. Thanks Amber. Those are great tips! Thanks for sharing Gigi! the Coco Lopez is usually less expensive in the hispanic section of the grocery over the liquor section. i love coconut ice cream…..perhaps with chopped almonds and magic shell….but it would make an awesome pina colada ingredient….i love ice cream drinks! thanks for the recipe. Sounds like I’ll have to check the hispanic section of the grocery store! Thanks! You can try using 2 cans of full fat coconut milk, but you will need to puree everything in a blender/food processor and then churn it in an ice cream machine instead. I’m not sure there is a way to make it no churn with the coconut milk. I have made a coconut whipped cream with just the cream of the coconut milk, but it doesn’t have as near as much volume/yield as heavy whipping cream, so it’s hard to say. That’s my best suggestion. Good luck! this sounds great. 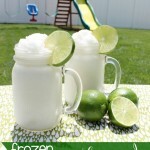 i love my pina coladas, i’m tryin this with some rum in it! I was all excited until I saw heavy cream. Can’t have cow’s milk. Any alternative? OMG!!! This was the most delicious coconut ice cream I’ve eaten. And so simple to make. My husband asked me to mix in some chocolate bits and it was delish! Thank you so much for this awesome recipe!! I’m so glad you liked it! Great idea with the chocolate bits! When I made this ice cream, it became rock like the next day morning. Now I have to scrap it like snow. It is very tasty, but I wish it were smooth like ice cream. I did find some body else had same issue, but got resolved after changing the brand of the coconut milk. Can you guys please explain how did you “fold in” the coconut cream? Just mixing gently with the spoon? Did you churn it in the mixer after adding the coconut milk. Cream of Coconut and Coconut Milk are two very different things. Make sure you have the right ingredient. Cream of Coconut (which is coconut, sugar, and water) is usually next to the alcoholic mixers or in the aisle with the hispanic ingredients. Its consistency is very similar to sweetened condensed milk. You will whip the heavy cream to stiff peaks then fold in the cream of coconut pour it in a container and freeze it. I hope this helps! Thank you Amber for your quick response. I used the organic cream of coconut only from Trader Joe’s. I used a glass container to freeze and hope that should be ok. I will give another try with Coco Lopez and see. I’ve searched “Trader Joe’s Organic Cream of Coconut” and all I see is Coconut Cream which isn’t the same. I’ve only ever seen two brands. The Coco Lopez or Coco Real. Try one of those and you should be just fine. I just tried this recipe, it came out OK? at best, however upon trying mix after all mixing, I decided to ADD about 1/2 c sugar and 2 tsp. vanilla (for MY taste). That made IT slightly “better”, but I STILL like/want MORE coconut flavor in mine. Next time I will also ADD coconut extract to give it a bit more coco-nutty flavor, But it was still “decent” in my opinion. Thanks for sharing such an easy NO churn recipe. I wonder if you used coconut cream instead of cream of coconut. Cream of coconut is pre-sweetened and very sweet. It’s used in pina coladas. Double check. The only two brands I have seen is the Coco Lopez or Coco Real. My dear Amber, I used Cream of Coconut Goya brand. They also had Coco Lopez in my area, but they are both the same exact thing, except Lopez is bit more expensive and when they are the exact same product, we are going for the lesser expense — you know? 6 of one half dozen of the other, right? It still came out as I described in my comment. Guess I’m just used to MORE coconut flavor than that provided. But, IT was still good, also VERY creamy if I may add. Thanks again for your feedback, appreciate that. Do you know why the coconut water separated from the coconut cream and cream upon mixing? I think I may have over whisked but the water parts separated leaving a think lumpy mixture. The taste is great but texture is off. I will try this again! If the cream of coconut is separated in the can, whisk it first before pouring it into the whipped cream, then fold it. Hope this helps! Can you also put pineapple in this…if so how much? I would try a small can of crushed pineapple. Drain all the juice out and fold it in. Enjoy! Thank you for sharing this recipe. I made it today. Unfortunately, I was disappointed. The ice cream lacked flavor & was not nearly as smooth as the video suggest. Because coconut ice cream is my favorite, I won’t give up on this recipe just yet. Next time i plan to add crushed pineapple & sweetened coconut flakes & maybe even some nuts for added flavor & texture. 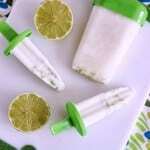 I also suggest pouring the mixture into Popsicle molds instead since the consistency more closely resembles that of coconut ice pops:). Hi Olga, What brand of Cream of Coconut did you use? It shouldn’t be “icy” at all. My husband is a diabetic and on a low carb diet. Has anyone tried the recipe using unsweetened cream of coconut and adding liquid Splenda for the sweetness? They even have a coconut flavored Splenda. Very interested in making. Not worried about calories or fat. I think you’re headed in the right direction for substitutions. I hope it works out for you! Unfortunately, as I am not a registered dietician, I am not comfortable sharing nutritional information for any of my recipes. I recommend utilizing online calorie counters at your discretion to obtain such information.